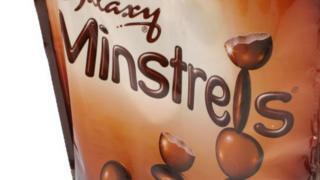 Chocolate maker Mars is recalling some bars of Galaxy, Maltesers Teasers and bags of Minstrels due to the "potential presence of salmonella". "We are working closely with the relevant food safety authorities and our customers to ensure that the affected products are no longer available for purchase," Mars said. Mars said thousands of potentially affected chocolates - fewer than 3,000 - could already have been sold to customers. Tesco told the BBC that it wasn't going to sell any of the affected products it had in stock, whatever the best before date, as a temporary measure to help avoid any customer confusion. The chocolate products affected were made at Mars' Slough factory. People who have purchased the affected confectionary should contact the Mars customer call centre for "returns and reimbursement", it said. The Food Standards Agency said the recall "is for a small number of products and is on a precautionary basis."